What Are the Northern Lights? What They Are and How to See Them. Until tourists are playing pickup basketball on the moon, the northern lights might be the only bucket list travel item in the sky. The blazing, dramatic display of dancing lights is awe-inspiring. But what creates the abstract swirl of greens, yellows, reds, and purples? It starts with the sun. Sunspots are created by our closest star's many overlapping magnetic fields. When they boil and burst, charged particles (plasma) escape the sunspot. That solar wind rockets out into space, traveling the 93 million miles to Earth to create a nighttime aurora in about 40 hours, per Space.com. The arrival of those winds at Earth create the aurora borealis (northern lights) and the aurora australis (southern lights). The solar cycle hits its most active period about once every 11 years. The last peak came in 2013, and when the solar cycle peaks you get sunspots and solar storms that create the most vibrant and far-reaching displays. Right now, we're near the solar minimum. (Solar maximum and solar minimum are not one point in time, but a long stretch of time.) That doesn't mean the aurora disappears, but it can be less powerful and will reach far south with less frequency. "When we see the northern lights, it's driven by a large eruption on the sun," explains Aurorasaurus founder and space scientist at NASA Dr. Elizabeth Macdonald. "And those happen more frequently, though not exclusively, during solar maximum times." The Earth's magnetic field serves as a sort of shield for all the radiation and magnetic waves that crash over the planet. The particles in the solar wind are drawn toward the north and south poles by the magnetic field. As that happens, the particles mix with the molecules in our atmosphere -- oxygen, nitrogen, etc. -- and that interaction creates the colorful display. The most commonly seen colors in the auroras are pink, green, yellow, blue, violet, orange, and white. Though, some of those colors are rarely seen. Space.com notes that when the particles combine with oxygen, you get yellow and green. When they interact with nitrogen, you'll see red, violent, and sometimes blue. Though, the site notes, it's more complicated than that because the type of collision and the altitude will impact the colors displayed as well. Alaska and Canada are outstanding places to see the northern lights. Spots like Norway, Sweden, Finland, Iceland, Greenland, and the northern coast of Russia are also known for providing a great hub. 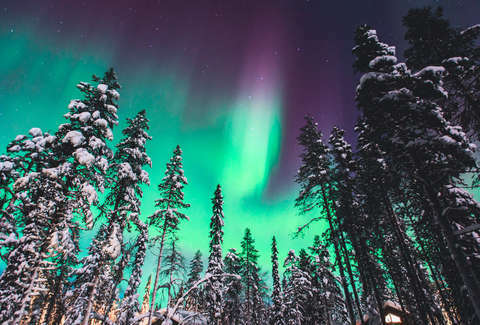 When solar activity is heightened, you will sometimes see the lights reach further south through Canada to states like Montana, North Dakota, Minnesota, Wisconsin, Michigan, and Maine. Occasionally, major solar events will bring the display even further south. When do the northern lights happen? The lights are present throughout the year, but winter is usually the best time. That's partly because there's less light pollution. Especially in northern countries where there's considerably more sunlight in the summer months. However, under the right conditions, you can see them any time of year. Nonetheless, the best time to see the lights tends to be between September and April. If you're going to start hunting them down, there are a lot of tools you can use. About 40 hours after sunspot activity, you'll get a brighter and more active aurora that often reaches further south than usual. The Space Weather Prediction Center's 3-Day Aurora Forecast is a good place to keep tabs on how sunspot activity impacts aurora sightings. There are also tools like Aurorasaurus and the SWPC's 30-minute forecast that track the northern lights around the world and may help you find a good time to get a glimpse. The northern lights could appear as far south as the northern US on July 24, 2018.